The 1997 general election was an unusual contest fought against the backdrop of an improving economic situation. The outgoing Rainbow Coalition of Fine Gael, the Labour Party and the Democratic Left had produced a budget surplus, an unfortunately rare achievement in the troubled economic history of the state. This did not mean the election was going to be plain sailing for the coalition, however. The previous election saw the formation of a Fianna Fáil-Labour coalition, contrary to Labour's then campaign promise not to work with Albert Reynolds' party. Though they would walk out on Fianna Fáil two years later - thus forming the Rainbow Coalition with the other parties - their reneging of that promise was still in the minds of the electorate. Labour therefore lost the impressive gains of the "Spring Tide" - losing 15 seats and bringing them down to 17. 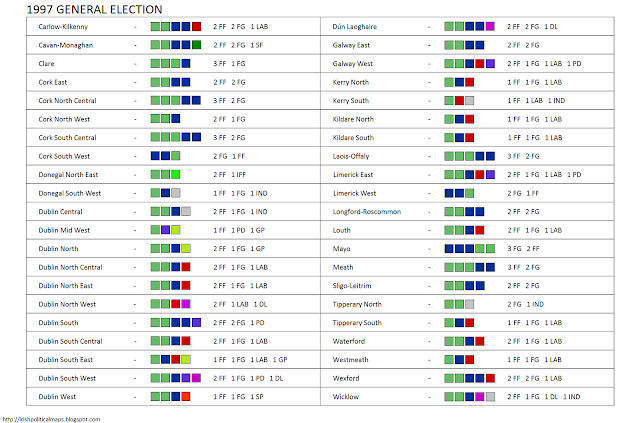 Fianna Fáil and Fine Gael both made gains (10 and 7 respectively). 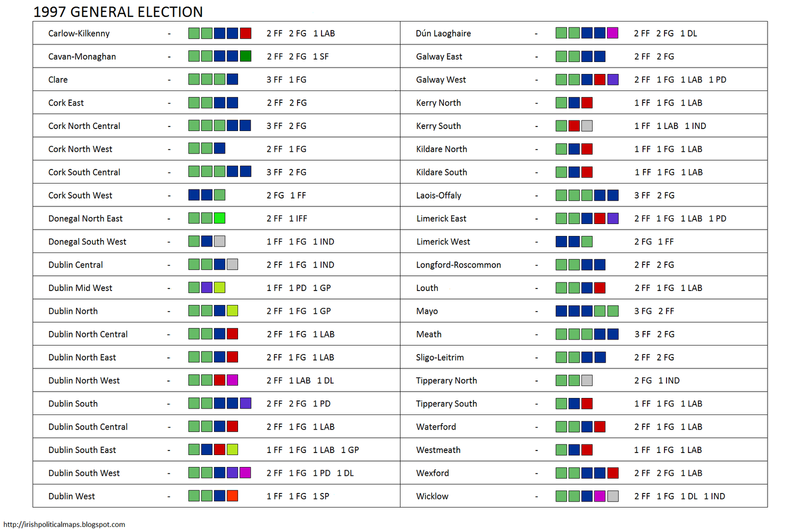 Fine Gael's share of the vote rose by 3.4%, one of their best results in an election as an incumbent government party. The heavy defeat of Labour, however, meant that the Rainbow Coalition was not automatically returned. Of the smaller parties, both the Progressive Democrats and the Democratic Left also suffered, with both being reduced to 4 seats. Other parties made gains - Sinn Féin won their first seat since 1957 with Caoimhghín Ó Caoláin in Cavan-Monaghan - this was also the party's first seat since they voted to recognise Dáil Éireann in 1986. The Green Party increased their total to 2, and the Socialist Party won their first seat with Joe Higgins in Dublin West. Independents won 6 seats in total. 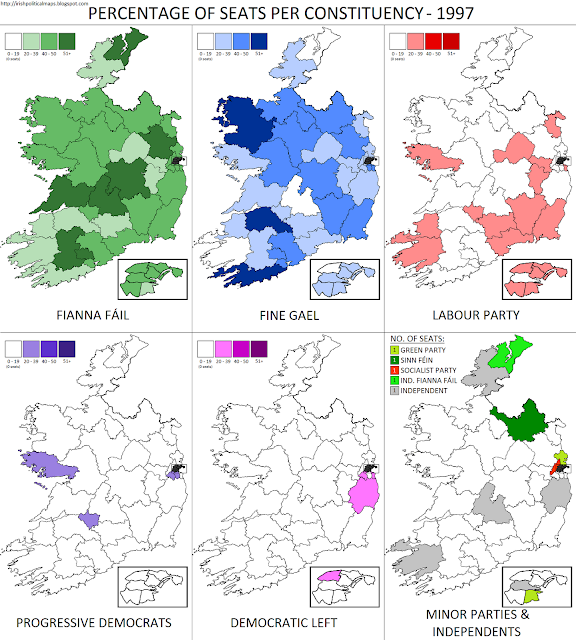 With the Rainbow Coalition unable to make up the numbers they previously had, Fianna Fáil and the Progressive Democrats agreed a coalition deal and took up governance, beginning a 14 year run of Fianna Fáil in office. A greyscale version is available here.